Not a member and want to join? Click here for more information. Botanists from around the state lead these enjoyable and informative walks. Please let trip leaders know you are coming in case of last minute changes. Be sure to call them if the weather is uncertain. May 17th – White Cliffs Natural Area – 10:30 AM. 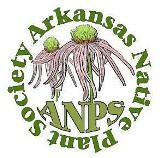 Join Arkansas Natural Heritage Commission botanist Brent Baker for a tour and plant walk at White Cliffs Natural Area in Little River County in southwest Arkansas. White Cliffs Natural Area occurs on a large outcrop of Annona Chalk rising out of the Little River floodplain, surrounded by Little River and Millwood Lake. It includes a 100-foot high chalk bluff over the river, from which it derives its name. A continuum of plant communities reflects a range of elevations at this site from the floodplain to the ridgetop. The area includes the largest and least disturbed Arkansas occurrences of chalk woodland. This community type is unusual for Arkansas as it is more typical of vegetation found on the Edwards Plateau of Texas. Areas of blackland prairie should also yield blooming pale purple coneflowers, plains larkspur, showy beardtongue, and other wildflowers typical of this community type. There is an established trail about 1.75 miles long that is rated easy to moderate, but we would likely spend part of the day off-trail, though we should still avoid the more strenuous parts of the area. White Cliffs is about a 2 ½ to 3 hour drive from Little Rock and we would start the tour at 10:30 AM and end in mid-afternoon. Participants would need to bring a sack lunch and plenty of water. Due to the logistics of this field trip, participants will need to sign up in advance by contacting Brent by email (brent@arkansasheritage.org) or by phone (479.970.9143) by Tuesday, May 12th. This trip will be limited to 20 participants.